Pay Any Price takes an important step toward the $1 million Breeders' Cup Turf Sprint (G1) Sunday when the world-record holder for five furlongs on turf carries high weight in the $75,000 Tamiami Handicap at Gulfstream Park. The 8-year-old gelding, who ran five furlongs in 53.61 seconds while winning the Silks Run at Gulfstream last year, has been assigned to carry 130 pounds, between 12 and 15 pounds more than his six rivals (not counting two main-track-only entrants), in the five-furlong turf sprint. Pay Any Price, who has won eight of his last 11 starts and 14 of 23 lifetime races, will seek his fourth straight triumph in Sunday's featured fourth race. If all goes well, the son of Wildcat Heir would be on track for a possible start in the 5 ½-furlong Turf Sprint on the Nov. 3 Breeders' Cup card at Churchill Downs. Regular jockey Edgard Zayas has the return mount. Owner/trainer Eddie Broome's Brandy's Girl is set for a return from a 7 ½-month layoff in the Tamiami. 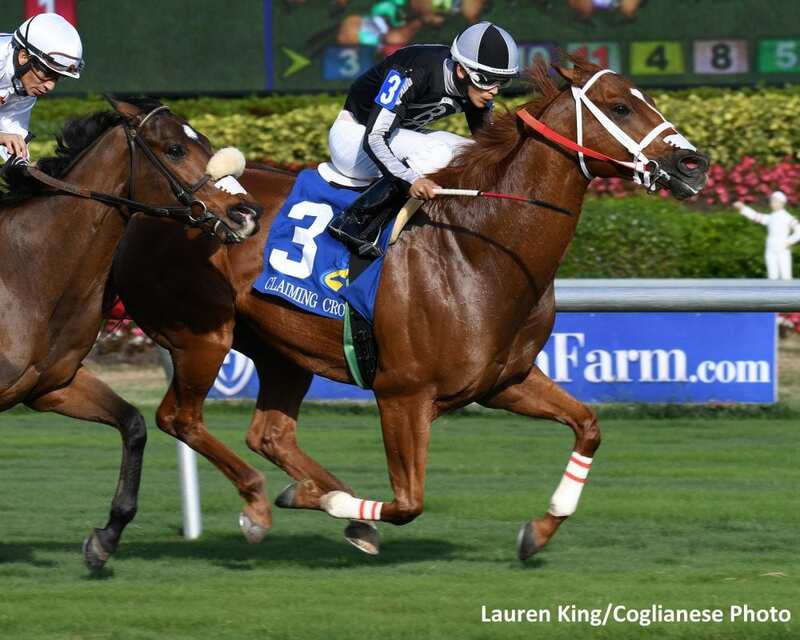 The multiple stakes-winning 6-year-old mare beat the boys in back-to-back five-furlong turf races last year at Gulfstream, including a brilliant triumph in the Jupiter Beach Stakes. She finished second in last year's Tamiami, a half-length behind next-out winner Extravagant Kid, who most recently captured the Lucky Coin Stakes at Saratoga. Luca Panici, who was aboard for the Jupiter Beach score, has the mount aboard the daughter of Posse. Trainer Ralph Nicks has entered Rustlewood Farm's Tropicat, a multiple winner over the Gulfstream turf, and Raroma Stable's Phantom Ro, the 2017 Florida Sire Stakes Dr. Fager Division winner who has yet to run on turf. Emisael Jaramillo has the mount aboard Tropicat, while Tyler Gaffalione has been named to ride Phantom Ro for the first time. Focus On Me and Moonwalker round out the field. My Friend Flaven and Field Trip are main-track-only entrants. This entry was posted in Breeders' Cup, NL List and tagged Breeders' Cup, breeders' cup turf sprint, gulfstream park, pay any price by Press Release. Bookmark the permalink.